I have big, beautiful tomato plants. It is past time for them to have tomatoes on them but I have very little tomatoes or none at all on vine. Why is it I have all vine and no tomatoes? 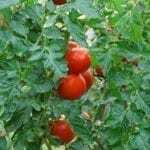 Tomatoes produce during warm/hot conditions. This time of year, they will normally cease production as the nights are becoming much cooler. 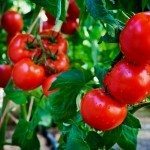 However, here are some of the more common reasons for tomatoes not producing: factors that prevent tomatoes from setting fruit include lack of pollinators, low temperatures (below 50º F), high temperatures (over 90), a lack of sunlight (less than 8-10 hours), inconsistent watering, damage from pests (e.g. thrips), or too much nitrogen fertilizer (produces foliage growth but no fruit). Are your plants getting frequent visits by pollinators (bees)? If not, you can lightly shake the plants when in bloom or hand pollinate them. Make sure the temps are regulated, ensure they are getting enough light, give them plenty of water but be careful not to over water, check for insects (look at the leaves, stems, etc. ), and try giving it a boost of fertilizer using about 3 tablespoons of Epsom salts to 1 gallon of water.